A long line of visitors descend! September October is officially low season in the BVI’s when pretty much everything closes down and the majority of boats are taken out of the water in preparation for the worst of the hurricane season. As we are the newest members of staff and also still skint after a year in Curacao we couldn’t afford to take a month to 6 weeks off like the rest of the crew, so instead we invited all our friends and family over here! Luckily due to the risk of hurricanes it also means the price of flights go down enormously which makes it much cheaper to travel from the UK. Even so we were still surprised by the amount of people who took us up on our offer which meant low season was going to be anything but quiet for us! First to arrive were Sheena and Val. Sheena’s getting married in November and Val and I are lucky enough to be bridesmaids. Val has already done a tremendous job of helping Sheena organise bits and pieces for the wedding as well as a hen night in Edinburgh complete with Fire Engine tour! Unfortunately work schedule and lack of money meant that I couldn’t be there to help so the least I could do was get the two of them out for a relaxing week of sun and fun before the big event. We started the week with a very indulgent day at the Little Dix 5 star resort spa, followed by not such a healthy lunch and topped off with cocktails on the beach at sunset. Val even managed to confuse the barman enough that we got an extra round for free! Sarah is one of my best friends and enormous fun to be around but by her own admission she and her now very grown up daughter Shanice are anything but quiet! We are always guaranteed to have lots of belly laughs and drink copious amounts of wine whenever they come to visit and this time was no exception. As their visit only overlapped by two days with Sheena and Val I decided this would be the best time to have Sheena’s BVI hen do. Nightlife in the BVI is limited at the best of time’s let alone in the low season when pretty much all the bars are closed, so instead I decided to do something a bit different and charter a 46 foot catamaran with our trusty friend and captain Andrew (aka Kirk). Kirk has taken us sailing on day trips around the BVI a few times but I don’t think he really knew what he was letting himself in for this time! Along with the British contingent all the ladies from the Dive BVI crew were in on the secret and the day started bright and early at the Marina at 7am with everyone but Sheena and Val waiting in 70’s wigs and ‘soul chick’ swimwear waiting on the yacht. 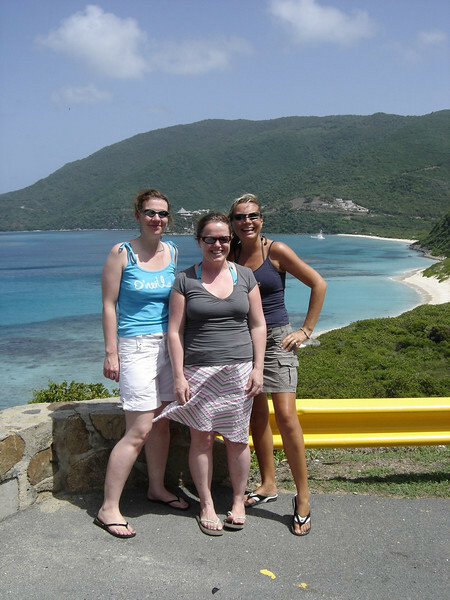 We had told Sheena that we were simply going over to Tortola on the ferry to do some shopping so she was understandably a bit surprised and confused to see 10 madly dressed girls yelling and waving at her from a boat when Andy dropped them off at the marina. In fact it wasn’t until Sheena actually stepped onto the boat that she realised what was happening.